But it’s not often that those of us who travel get hungry. In terms of real hunger, probably never. And we most likely won’t have ever experienced famine and malnutrition around us. (*UNFAO). So many of the countries we visit on our travels are ravaged by food scarcity (see this world Hunger Map). In places where we take for granted sensory pleasures of gastronomic delights, at the local market or restaurant, many local people are under-nourished with inequality. Rural communities suffer the inability to make ends meet from the land, forcing city migration, and loss of traditional community and culture. SDG #2 "End hunger, achieve food security and improved nutrition and promote sustainable agriculture"
For many of us, food is an integral part of travel. We try different ingredients, taste different meals, appreciate different cultural dining experiences and increasingly like to see how our food is produced and made, taking local cooking lessons where we stay and the opportunity to support and interact with local people as part of our travel experience. Even at home, many of our food choices can impact energy consumption, agricultural land, soil erosion, forests, freshwater, the marine environment and climate change in the places we love half the world away, degrading our biodiversity and ultimately leading back to our own food supply chain. Pangaea Exploration offer trips to support marine conservation and see for yourself the plastic in the ocean which damages the ecosystem, food chain and ultimately human health. Man-made climate change adds even further pressure on resources, increasing risk of drought and flood. RSC in Malawi donated food to help their drought food campaign. Hunger is not having enough to eat to meet energy requirements. Hunger can lead to malnutrition, but absence of hunger does not imply absence of malnutrition. If food is not enough or the right sort of nutritional value with sufficient vitamins and minerals, the impacts of malnourishment can be immense: Children suffer reduced physical and mental development, people are less able to resist disease, do physical work, learn, earn as much, carry a pregnancy or breast-feed a child, or live as long. Stunting is estimated by UNICEF to affect 161 million children worldwide and 'hidden hunger' (enough calories, but micronutrient deficiencies) over 2 billion people worldwide (UN World Food Program, 2017). Malnutrition and disease is a vicious cycle, merely feeding each other, with a critical window in the first two years of a child’s life which can determine or prevent largely irreversible damage. In Madagascar, most people work in subsistence agriculture and have limited secure food sources. Inadequate diet means 50% of children under 3 are malnourished and suffer stunting; 10% die (40% in rural areas) before the age of 5 from easily preventable disease, such as diarrhoea. Despite progress of a 42% reduction since 1990–92, the United Nations Food and Agriculture Organization (UNFAO) estimates about 795 million of the 7.3 billion people in the world (1 in 9, 11%) were suffering from chronic undernourishment in 2014-2016. There are now 11 million people undernourished in developed countries: Almost all the hungry people, 780 million, live in developing countries, representing 12.9 percent, or one in eight, of the population of developing counties (World Hunger Education Service 2015). In tropical areas, where habitat degradation and biodiversity loss are exceptionally high, human imperatives such as food security are also particularly challenging. The most populous region in the world, Asia, is home to two out of three of the world’s undernourished people. And there has been the least progress since 1990-92 in the sub-Saharan region, where more than one in four people remain undernourished: Whilst the prevalence of undernourishment in sub-Saharan Africa declined from 33.2% in 1990–92 to 23.2% in 2014–16, due to population growth, the number of undernourished people has actually increased. The target for the Millennium Development Goals for developing countries as a whole was to halve the proportion of hungry people by 2015 from the base year(s) of 1990-2, or from 23.2% to ll.6%. As the proportion in 2014-16 is 12.9%, the goal has almost been met. But the world produces enough food to feed everyone and there is growth in food availability which has risen per capita from about 2220 kcal/person/day in the early 1960s to 2790 kcal/person/day in 2006-08, with developing countries leaping from 1850 kcal/person/day to over 2640 kcal/person/day. These improvements have seen hunger decline, but it is food availability access that is an issue, largely because many still do not have sufficient income to purchase (or land to grow) enough food. This is certainly the case in Malawi where more than 80% of the population are small holder farmers with access to not even half the sub-Saharan African average of 0.4 hectares. Poverty is the principal cause of hunger, and the economic and political systems in the world which control our resources, such as agricultural policies which reduce competitiveness and can lead to environmental damage and the inequitable distribution of benefits, conflicts and climate change. Climate change is increasingly viewed as a current and future cause of hunger and poverty, man-made by increasing world industrialisation and higher standards of living consuming high energy and emitting high levels of carbon dioxide. Food production in itself is one of the greatest net emitters of greenhouse gas (14-22% CO2), such as from animals, fertiliser use, transportation and global deforestation – of which, 75% is due to developing new farmland. (Dr. D Randle, 2013). Our diets, especially meats, especially beef, may even cause more CO2 than industry or transportation (UNFAO, 2006). Climate change exacerbates the risks of hunger and under-nutrition: Consequent extreme weather such as increasing drought, flooding, and storms have an adverse impact on crops, infrastructure, livelihoods and food security, requiring changes in farming practices that may not be easily accomplished. Malawi suffers greatly from issues: 2015 saw some of the worst flooding ever experienced, with the country unable to recover in 2016 due to significant drought, with vulnerable communities and children suffering. RSC supported the campaign (see video). You can learn all about the challenges and sustainable solutions there getting hands on with RSC's practical global development workshops. Long term, sea-level and water temperature rise will affect livelihoods in coastal areas and river deltas, and glacial melt will affect the quantity and reliability of available water, affecting the ecosystems that local communities depend on. Climate change will affect all four principal dimensions of food security (UN World Food Program, 2017). In turn, food insecurity can be a threat to a population’s and nation’s stability, and may even lead to government and civil society collapse. Many of the countries that failed to reach the Millennium Development Goal of halving the proportion of people who suffer from hunger have faced natural and human-induced disasters or political instability. People who are already vulnerable and food insecure are likely to be the first affected (UNFAO, 2008). • Food systems stability – climatic variability, food security of availability, accessibility, utilisation. Goal 2 commits to universal access to safe, nutritious and sufficient food at all times of the year by 2030. More investment is needed to increase the productivity of agriculture, yet government spending is not forthcoming and aid is diminishing, so the sector also needs to look to sources of private investment, both domestic and foreign. In recent years, Madagascar has suffered from public service expenditure and donor aid cuts, food price inflation, and cattle asset prices halved, right when it needed it most. SEED Madagascar work to develop food security, livelihoods and health through agro-forestry, bee-keeping and fuel-efficient stoves – you can help. We not only need to rethink how we grow, produce, distribute, share and consume food globally to nourish not just today’s 793 million hungry, but the additional 2 billion people expected by 2050. Coastal community fisheries employ nine out of 10 people who work in fisheries worldwide (CI, 2017). To help coastal communities out of marine conservation problems such overfishing, responsible management can improve the well-being of ecosystems and climate change adaptation and mitigation, with new tools and techniques to improve productivity and enable access to market, supporting livelihoods. Seafood, consumed more than any other animal protein in the world - more than pork, chicken, beef and eggs - is the main protein source for 3 billion people and the last major food source that humans collect from the wild, 50% of which is provided by small ocean-dependent coastal community fisheries, to whom the sustainable environment is critical. SEED Madagascar works with 400-500 fishermen for sustainable lobster fishing, which can generate 80% of household income, on a model to be replicated nationally, including No-Take Zones and minimum lobster sizes. In sustainable destinations such as Chumbe Island, where the Marine Protected Area was established for marine conservation, healthy waters lead to thriving ecosystems and fish populations, mentioned in a UN Secretary General’s 2012 report: The No Take Zone and fishing practices allow fish to reproduce and create more fish. Fishers are thus motivated to protect and sustainably manage the waters to ensure fish health and yield availability. How can Tourism Help Food Security and Nutrition? There are around 25% less people under-nourished in the world (795 million) than there are international tourist trips (1. 2 billion, UNWTO, 2017). As food scarcity grows, tourism can provide the demand and support required for food production, energy costs, jobs, livelihoods and inter-sector local economic growth. This may help destinations’ development, and also drive tourism resorts to become more sustainable: Producing some of their own food and making more sustainable choices (eg. seafood, organic, hydroponic) for the longer term is more attractive. - Reduced soil erosion from fertilisers and hydroponics (growing plants without soil, using mineral nutrient solutions in a water solvent). - Reduced land requirements – 1/14th - with hydroponics. - Reduced water use by up to 90% with hydroponics. - Less pollution in the food chain, with less fertiliser use. - Reduced transport bills – local food covers little distance. - Local food supply chain and local economy support via inter-sector linkages. - Fresher food, better quality, better nutritional value. - Promote more sustainable menu options for tourists’ better experiences, such as local sustainable seafood over beef. - Better livelihoods and health for host communities. Chumbe Island in Tanzania (right), follows these principles. At Nikoi Island in Indonesia, the menu is fixed to reduce food waste and focus on seasonality – home-made, organic and guideline-compliant, such as WWF sustainable seafood. 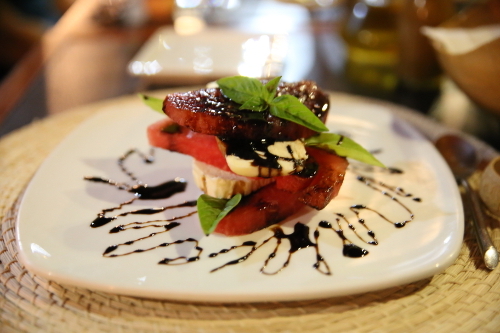 Lapa Rios in Costa Rica offers a gourmet local culinary experience, developed based on cultural tastes and local and community-planted home-grown produce of Central American endemic fruits and vegetables. Jicaro Island Ecolodge also has a strong focus on local ingredients and Nicaraguan cuisine creatively cooked simply by its masterchef. As people have become more interested in how their food is produced, so agritourism or agrotourism is rising; that is, travel for the purpose of experiencing agricultural life, to live in small communities of rural people, to see working farms, ranches or fishermen and participate in activities such as animal and crop care or wade in the sea with local fishermen hauling in nets. Host tourism destinations can support local agri-tourism opportunities with market access, logistics and customer services to enable an increase of interest and income in local communities, leading to a more resilient agriculture, livelihoods and local pride, while enhancing the value of the tourism experience. Food has become an important part of the tourism location choice, often dependent on what food and drinks can be sampled there, such as farm-to-table preferences (ehotelier). Jicaro Island's freshly caught seafood not only supports the local fishermen economically, but helps them learn about sustainability approaches, and creates an opportunity for cultural exchange with guests who are more than welcome to observe and learn the local and traditional methods of fishing, and watch the master chef in the open kitchen, whilst over looking Lake Nicaragua. The rise of culinary tourism and experiences such as food festivals, tasting tours and cooking lessons is unsurprising given the rise of experiential travel and an increasing interest in food, its provenance, TV food shows and celebrity chefs. Our social media accounts are proliferated with images of gorgeous gastronomy customer-generated content, used for follower fodder and destination marketing delight: This is word of mouth to be trusted. In tourism, this interest has also enabled ethnic foods to gain visibility, at times to rejuvenate and conserve local food and culture, and to export to international tastes, and markets for ingredients. As the world industrialises and homogenises, more and more people look away from previous colonial or globalised food culture, to search for authenticity – interested in experiencing what a location is known for - local cuisine and reconstruction of local identity through food.